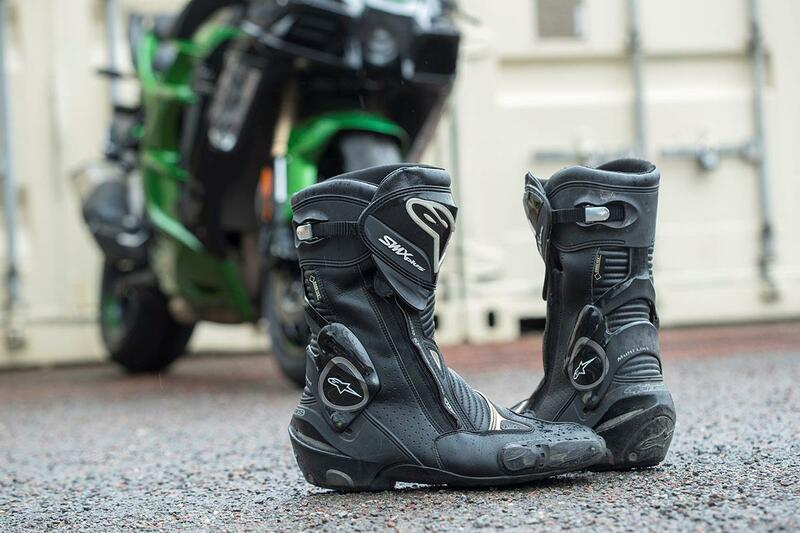 Over the years we've reviewed the Alpinestars SMX Plus Gore-Tex boots multiple times. Find out how our experts got on then and what we think now. 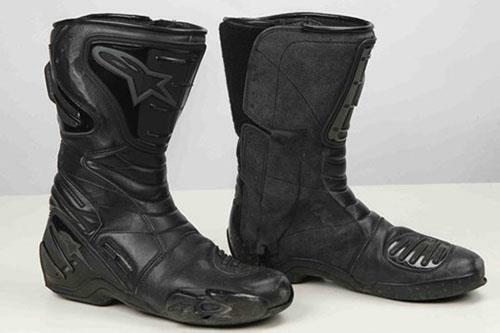 There is a good case for these Alpinestars (above) being the only boots that you would ever need. With articulated ankle armour and a snug fit, thanks to the inner lacing and ratchet calf adjuster, they offer the performance and protection of a mid-priced race boot. However, the Gore-Tex lining means they also allow all-weather, all-season riding and it takes a sustained high-speed day in torrential rain before you get even the slightest rain ingress (at the toes). What’s more, they’re warm enough in winter without being sweltering in summer. After four years, they still look pretty good and work well and for road riders they’re a great choice. But despite being high quality, there’s no getting away from the price tag which, at a penny shy of £320, is undeniably expensive. I’ve worn Alpinestars Supertech R boots ever since the Italian firm released them, and despite trying several other brands and boots down the years, I’ve never found anything that could match them for comfort or protection at a similar price. Until now. These S-MX Plus jobbies are superb for all-day comfort, without relinquishing much in terms of performance. They feel well constructed, and the internal lining is plush enough that a full day on the bike, combined with a lot of wandering about off it, can be dispatched without sore soles or chafed calves. I wear these boots every day (rain or shine), and they’ve stood up well. Some of the white plastic areas have discoloured a little, and the main white upper is hard to keep spotless – but overall they look almost new after more than 6000 miles. The new screw-fixed toeslider system is a big improvement over the old clip-in version too. What I don't like it the white areas do discolour, and white areas of the synthetic upper are hard to keep spotless, but that’s hardly a shock. The price is obviously quite high, but commensurate with the quality and features. I reckon that if you’re an average UK rider, these will last you a decade. They’re warm, comfortable, completely waterproof, sturdy, beautifully-made and don’t look big and frumpy, like a lot of all-weather boots can do. These are my everyday boots, which toured across Europe, been on countless road-riding launches, come with me to work and have been my companion on many a weekend away. I’ve even worn them for racing, when it’s been wet. Alpinestars is celebrating its 50th anniversary this year and it started out making boots, so these represent half a decade of expertise. A hard plastic heel, ankle and shin guards should offer protection in a crash (although thankfully I haven’t had to test them yet) and the soft leather sections are perfect for comfort. The soft padded interior is a nice, comforting thing to step into in the morning, before heading out on the bike, the main zip is sturdy and they have replaceable toesliders for when you’re low. They’re simply excellent. The only thing I don't like is the plastic sections squeak a bit when you’re walking. I’ve been wearing these very durable waterproof boots for five years. I use them for my daily commute and on biking holidays. They’re warm, fully waterproof, look great and are lightweight enough to wear on a sports bike, even on track. They also have toesliders for when you get a bit carried away. 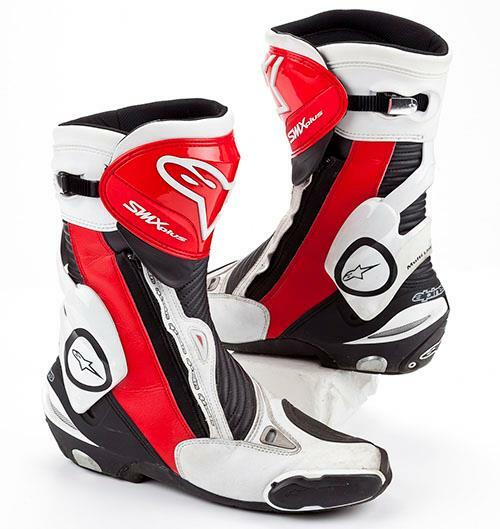 Alpinestars started in business by making boots and they do it extremely well, so it’s no surprise these have stood up the test of time perfectly. They’ve done well over 10,000 miles, they’re still in tip-top condition and still clean up like new. For more information visit the www.alpinestars.com website.